Aloha! 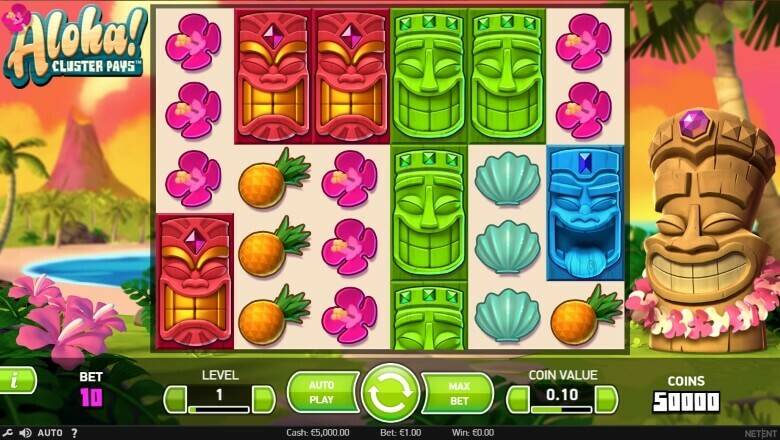 Cluster Pays is a colourful, fun-filled Hawaiian adventure slot from the well-known games developer NetEnt, offering a different way to play that involves clusters of symbols to win rather than pay lines. With a truly authentic feel to its setting using a combination of colourful graphics, symbols and sound bits, this slot is a joy to play. The layout of the game is based around 6 reels and 5 rows and an extremely joyful Tiki who every now and again burst into life to add an extra bit of fun to the game. This is especially true when you hit a win. The game includes Substitution Symbols, Free Spins and Sticky Win Re-spins so there is lots to keep you entertained. As already mentioned, this particularly slot has no win lines but uses the cluster feature. This means a group of 9 symbols or more clustered together both horizontally or vertically will award a win. The game has 8 coin value setting from 0.01 up to 2.00 and 10 levels. This means you can spin the reels from as little as 10p up to a maximum of £200 per spin. With a maximum win of 10,000 coins for 30 Red Tiki’s in a cluster x the maximum level which is 10 x your maximum coin value of £2 gives you a series top prize of £200K. As the game plays the colourful symbols which are made up from pineapples, coconuts, colourful Tikis, seashells and flowers spin elegantly across the screen with a sound of soft sand like sound. The animation when you have a win of a flame around the cluster symbols all help to make the Aloha! Cluster Pays game extremely easy on the eye. As with all slots, it is best to check out the game information first before you play, especially the paytable so that you know what you are aiming for with each spin. Click the ‘i’ symbol and you will be presented with 7 screens detailing all the information your need to play. As mentioned earlier the top jackpot prize at the maximum level and coin value is for 30x Red Tiki’s. However, just 9 symbols in a cluster will see you achieve a win. A cluster is where symbols are adjacent to each other whether that be horizontally or vertically. You will also find that the Aloha! Cluster Pays Video Slot has what is called substitution symbols denoted by question marks within boxes. These can appear on any row and will substitute themselves for the adjacent symbol giving the highest win possible. If you do get a cluster win then this can randomly activate the Sticky Win Re-Spin feature. This is where your winnings symbols remain on screen while all the other symbols re-spin. If your cluster size increases because of this then they will stick too and the remaining symbols continue to spin. The game also has Free Spin Symbols and 3 or more (up to 6) will activate a series of three spins between 9 or 12 free. You can even accumulate more free spins whilst these are activated if you obtain the symbols again. 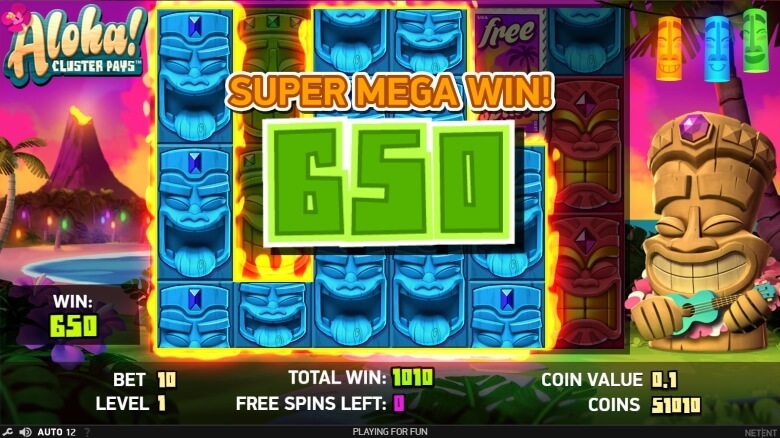 One unique feature of the free spins is that if by the end of them you have not had a win you will get a further free spin until you do win. The free spins also will see lower value symbols dropping away so as to give you the highest possible win. Once you are familiar with how the game plays you just need to set your preferred stake and level. On the bottom of the game on the right, you can set your coin value and the level of play on the left. Level 1 with a 0.01 coin value equals a 10p bet per spin whereas level 10 with the maximum coin value of 2.00 equals £200 per spin. You then spin the reels using the large green coloured button in the centre of the bottom part of the game. You will also see options to Auto Play and instantly bet the maximum. The auto-play feature allows you to set anything between 10 and 1,000 spins and your pre-determined level. Aloha! Cluster Pays has become an instant hit with many players and many online casinos such as Betspin Casino and GDay Casino have the game predominantly displayed on the front of their homepage. A good tip when you want to play a video slot you have not used before is to try them out for fun first. Both of these online casinos mentioned above allow you to play Aloha! Cluster Pays for free in demo mode. You can then at any time switch to real cash play. You will find as with many video slots that you can have a few dry spells whilst waiting for the wins to come in but be patient because when they do they appear to be a bit like waiting for a bus. All of a sudden quite a few come along at once. Is Aloha! Cluster Pays the right slot for you? The Aloha! Cluster pays is different in the fact that you have no dedicated pay lines, so if this is something you prefer then maybe this particular game is not for you. However if you like something a bit different then the cluster feature makes for an interesting game, especially when the Sticky Win Free Spins kick in. In can be quite a while before the free spins symbols drop in line and based on our play we would consider this to be a medium variance game. Therefore, if you are looking to play through a free casino cash bonus you will have a fairly good chance to meet the wagering requirements. The combination of fairly frequent wins and some larger prizes mean that you have the best of both worlds.The game has a decent RTP (return to player) of 96.42% giving a house edge of 3.58%. You should, therefore, see quite a good run for your money. In summary, the Aloha! Cluster Pays is not an over complicated game and is fun to play with its brights colours, tropical sounds and unique cluster feature. If you like to play online slots that have a feel good factor about them whether you win or lose then take a trip to Hawaii with Aloha Cluster Pays.